If you are new to wagering on horse racing, or even if you have just a few punts a year then, the thought of betting on the Grand National (a race with 40 runners) can be daunting. Though, with reams of Grand National trends & Grand National statistics at your disposal, there has never been a better time to be a horse racing punter. The Grand National was first run way back in 1839, and being won by the aptly-named Lottery, it’s a contest that is steeped in history. Therefore, several positive and negatives trends have emerged. We can use these past stats to look for the best profiles of past winners and apply these to the 2020 Grand National betting odds. After all, if a certain type of horse has won this gruelling race more often than not, why wouldn’t you get history on your side? Focus on the horses that tick the best trends and rule out those that don’t, then place your Grand National bet. For example: Did you know that the last 7-year-old to win the Grand National was in 1940? Yet, each year punters still waste their money betting on horses aged 7. The same goes for betting on the Grand National favourite! 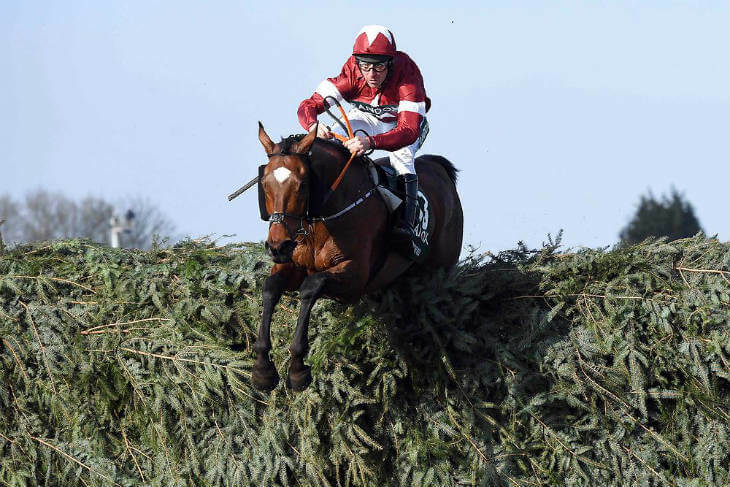 Yes, Tiger Roll won the 2019 Grand National as the 4/1 favourite, but he was the first winning Grand National favourite for 9 years. The Grand National trends don’t lie. So, to help we’ve got the main ‘plus and minus’ trends to apply to the Grand National trends in 2019. By following these simple rules, you’ll at least have the make-up of past Grand National winners before placing your 2019 Aintree Grand National bets. Irish-trained horses have a great recent record in the Grand National – winning 3 of the last 4 runnings. Runners that had hard races at the Cheltenham Festival, run the previous month, don’t fare well. With so much Grand National history, there are plenty of Grand National trends and stats to take into the race each year. Some trends have hot periods while others, like – as we’ve mentioned – the fact we’ve hardly seen any 7 years-old win the race, are simply ‘must-have’ stats you need to know before you bet on the Grand National. Yes, it’s likely that the Grand National winner will fall down on at least one or two key trends and you can get bombarded with stats prior to the race. Therefore, it’s key to decide for yourself which trends are slightly more important than others. But you can’t go too far wrong in just siding with the trends that have stood the test of time. After all, if something has happened more often than not in the last 20 Grand Nationals then, surely, it’s better to put the odds and history in your favour and look for horses with certain profiles that fit these key past stats. At first glance with 40 runners contesting 30 fences for 4 1/4 miles, the Aintree Grand National does have quite a scary look to it when it comes to trying to hunt down the winner. However, despite those daunting factors, you can often find the winner by following a few simple Grand National trends. Weight Watchers Some recent winners have carried 11st (or more) to victory, but looking back at recent trends make this weight your cut-off point. If you look back over the winners we’ve only seen the mighty Red Rum (1974 & 1977) and Many Clouds (2015) carry 11-8 or more – 21 of the last 28 winners carried 10st-12lbs kilograms or less! Since 1978, 120 horses have tried to win with more than 11st 5lbs – with just two winners – Many Clouds (11-9) in 2015 & Neptune Collonges (11-6) in 2012. Staying Power: Stamina is an absolute must when scanning down the entries. Year-after-year there are always plenty of hype horses that are certainly talented, but the big question surrounding their chance is will they stay the gruelling 4m 1/4f trip? You have to trawl back to 1970 and a horse called Gay Trip to find the last victor that won the Grand National having not previously won over at least 3 miles. Luck Of The Irish Our friends from the across the Irish Sea have raided these shores to win the Aintree Grand National many times in recent years, so certainly take a second glance at any of their runners. Six of the last 13 winners came from Irish-based stables and 15 of the last 20 winners were bred in Ireland! Fencing Master With thirty of the most unique obstacles in horse racing to contend with then having previous form over the tricky Grand National fences can be a huge advantage. Many recent Grand National winners had previously been tried over these Grand National-style fences in the past. The Topham Chase and Becher Chase – or a previous run in the big race itself – are the main races that are staged at Aintree racecourse over the same Grand National-style fences to look back at. 13 of the last 22 winners had won or been placed in a National-type race before. Three of the last 10 winners ran in the Scottish National the previous season, while 9 of the last 16 winners had run over hurdles at some stage earlier in the season. Five of the last 17 winners had been unplaced in the Grand National the year before. 20 of the last 22 winners had fallen or unseated no more than twice in their careers. Who’s Your Favourite The betting on the Grand National always picks up pace in the weeks building up to the big day, but on the Saturday itself, when the once-a-year punters hit the high streets, this is when the betting market really kicks into gear. It’s also worth noting that the weights for the Grand National are issued well in advance (normally in February each year), so with some horses often running well after they’ve been given their allocated weight and before the race then this can also impact the ante post Grand National betting. 6 of the last 28 runnings have been won by the favourite (21%), while 16 of the last 28 (57%) market leaders were placed (top 4 finish)! Remember, just two of the past winners or placed horses from the previous year’s race has won for 34 years (79 have attempted). The last horse to win back-to-back Nationals had been Red Rum in 1974. But in 2018 & 2019, Tiger Roll now also has that achievement on his racing record. Market Toppers We’ve already talked about the actual favourite, but this Grand National trend can be taken a bit further when you actually drill down into recent runnings. In fact, most winners in recent years started in the first eight of the Grand National betting market – indicating that despite the Venetia Williams-trained, Mon Mome, popping-up at 100/1 in 2009, that punters generally tend to get this race right. 9 of the last 16 winners came from the top 8 in the betting market! Fitness First Probably the biggest trend in recent years, and a really easy way to whittle the 40 strong field down in one easy swoop is just checking how many days ago your fancy last ran. The majority of the recent Grand National winners had their previous race no more than 48 days prior to the big day. While if you want to drill this trend down a bit further than you’ll notice that a large number of recent winners of the Grand National actually raced less than 40 days prior to landing the greatest steeplechase in the world. 27 of the last 28 winners ran no more than 55 days ago, while 22 of the last 28 raced no more than 34 days ago! Remember, Only 1 horse that won at the Cheltenham Festival that same season has won since 1961. New to betting on the Grand National? Check out our betting guide and our top tips for betting on the 2019 Grand National.